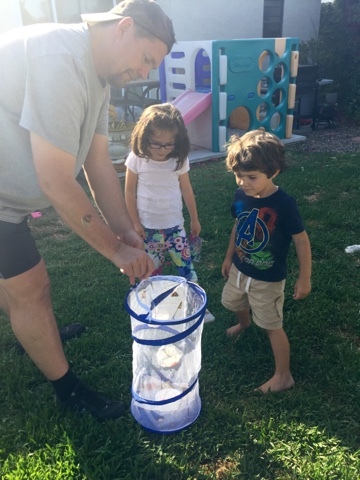 The amazing news that I wrote about in my last blog post, is that Tiny B just had a beautiful development in her metamorphosis...The doctor approved the removal of her feeding tube and we removed it that same night. When we had her tube placed at nine months old because she had stopped eating due to severe reflux, I had asked the doctor if she thought we would be able to remove it at a year of age. That makes me laugh now (and cry a little too!) because the reality is that we wouldn't be able to remove it for another five years. In between there was diagnoses of cyclical vomiting syndrome and migraines and then there was tube dependency (which I will write about at a later time) but God has allowed us to break free from the tube finally. There are still struggles and needs from being a micropreemie, but we will continue to grow and be thankful to God every single day. 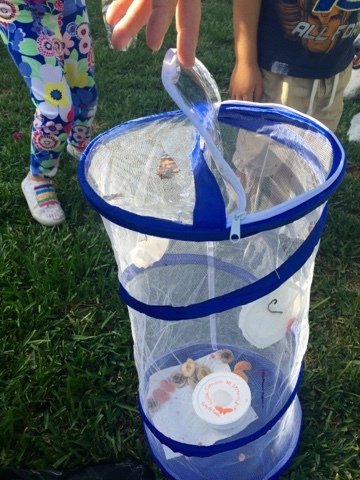 We released our butterflies and much to my surprise, that was the best part of raising the caterpillars! To see them feel the wind, see the sun, and find their wings for the first time was truly an experience that everyone should have! And it's not expensive! Look up butterfly kits online and you'll be surprised at the prices. Teaching is an art, and so is learning... Every month I order Dance n' Beats from Mother Goose Time. I do this for so many reasons...It's just a lovely program. It comes with a book of lesson plans as a DVD that has songs and dances. 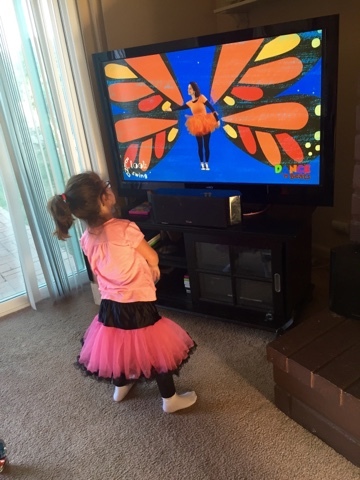 Your child basically follows the movement on the screen. The names of the movements are written on the screen which you can call out or just let the children see it for themselves. I also order it because it counts as part of Tiny B's PE hours (she is enrolled in a public charter homeschool) and it allows her to really focus on her gross motor skills. She spent years in physical therapy and I removed her from it when I felt that she could get the same amount of instruction from activities which are more fun for her, such as tumbling and Dance n' Beats! Strong B is three and a half, and he doesn't do the DVD's as often as Tiny B, but he enjoys them and has got quite a few dance moves from it that he likes to show off! Gosh, if he was ever fully clothed I'd actually have pictures of him to share here...I guess that's the life of a three year-old/homeschooler! The songs are the same as the monthly theme CD's that come with the Mother Goose Time main monthly curriculum. Therefore, they really get to know the songs well and can even begin to perform the moves when the DVD isn't on! The brain and body are connected, and it's sometimes a challenge for Tiny B's former micropreemie body to get the directions from her brain. 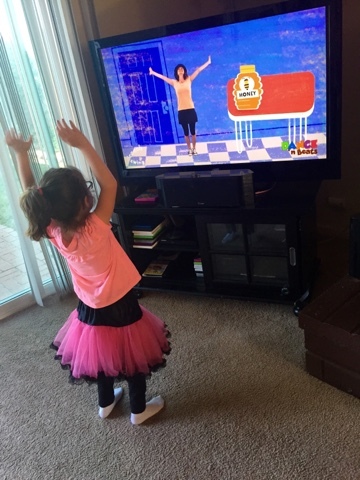 The repetitive nature of the movements and songs in this program really help her to cement those skills and ultimately gain confidence in her brain and body. I said earlier that learning is an art. 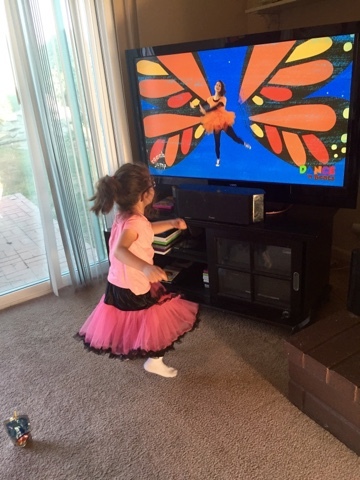 The kids really need to actively participate in the lesson in order for the objective to truly sink in...Tiny B likes to put her tutu on for the dances and even lines her babies up. Now that's active participation and truly turning her own learning into an art. I love watching my own butterfly children actively participate in their own learning and really make the lessons their own.